All transactions are safe and secure with a reliable history in online purchasing behind each of our associates. Buy the North by Northwest t-shirt to own Alfred Hitchcock clothing and merchandise. The ultimate case of mistaken identity plays out in the renowned movie North by Northwest. The film, which was released in 1959, stars Cary Grant as Roger Thornhill and Eva Marie Saint as Eve Kendall. The characters are followed from a simple train ride all the way to the top of Mount Rushmore. One of the most familiar scenes is highlighted on this North by Northwest t-shirt with Grant running from a plane dive bombing him in the middle of nowhere. Learn more about Hitch's progressive projects and life of achievement by grabbing an Alfred Hitchcock book or similar biography. 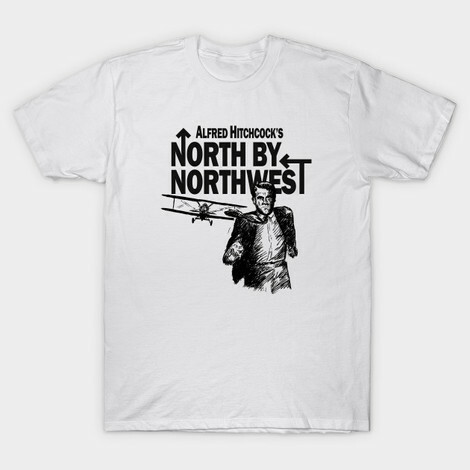 In addition to the North by Northwest tee above, browse the Alfred Hitchcock Clothing Gallery for more apparel like men's and women's clothes, kids shirts or hoodies.